GREEDY book sellers are cashing in on the suffering of Gerry and Kate McCann by charging as much as £172 for a book the couple has branded "downright lies". 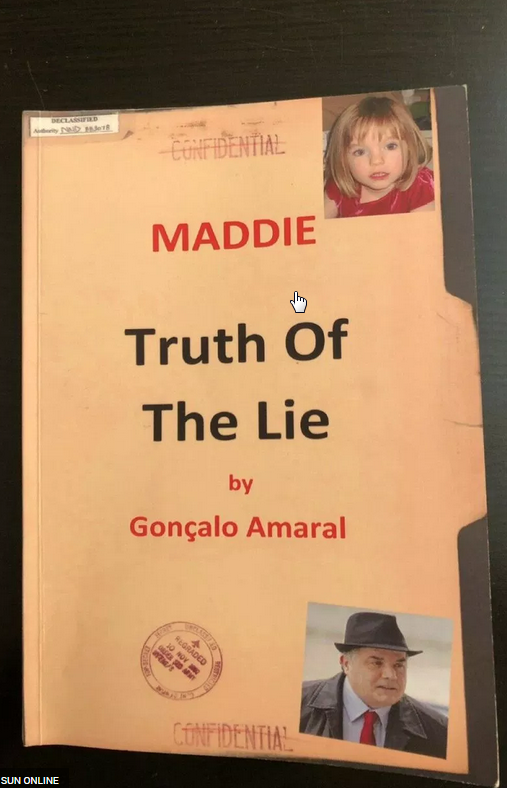 The Truth of the Lie was written by former Portuguese detective Gonçalo Amaral, who led the bungled probe into Maddie's 2007 disappearance. The controversial title was banned and Gerry and Kate were awarded around £375,000 in libel damages in 2015. Amaral claims three-year-old Maddie died in the family's holiday apartment in Praia da Luz and her parents Gerry and Kate faked her abduction to cover up the tragedy. There has been a surge of interest in the book after he featured on a new Netflix documentary about Maddie. Paperback copies translated into English have surfaced online, after it was only previously available in Portuguese, to cope with demand. DZK Books EU in Buenos Aires is selling the book for £172 on Amazon with free delivery. Paper Cavalier UK in London has the book priced at £146.99, with £2.80 postage. One seller, from Blackburn, Lancs, who has copies for £9.99 on eBay, said: "It’s a tough one, isn’t it? I feel so sorry for the child. I dread to think what actually happened to her." The book became a best-seller in Portugal when it was first published in 2008, selling more than 200,000 copies. It was banned for several years after the McCanns launched a legal action against Amaral in 2009, claiming the book was "unfounded and grossly defamatory". In 2015, Kate and Gerry were awarded around £357,000 in libel damages by a Portuguese court. A judge also banned further sales of Amaral's book. However, in April 2016, Amaral won an appeal against the decision, meaning he could sue them for damages potentially in the tens of thousands. The McCann's lost a subsequent appeal in Portugal's Supreme Court in February 2017. Top judges also ruled that Maddie's parents had not been ruled innocent with regard to their daughter's disappearance. The McCanns, of Rothley, Leicestershire, have appealed to the European Court of Human Rights in a bid to silence Amaral. The spotlight has been thrown back on the case by a new eight-part documentary called The Disappearance of Madeleine McCann on Netflix. The McCanns, both 51, refused to take part. The Sun on Sunday revealed last week how the McCanns were hit with £29,500 in legal fees for Amaral, after losing their libel case. Wicked profiteering on the backs of a man who fought for the truth about the disappearance of a 3-year-old British girl - and was pitifully mauled in the British press. It must be one of the most flagrant, egregious breaches of copyright in world history. The people doing this are criminals, pure and simple. Please may Goncalo Amaral be given strength to cope with the outrage he must surely feel when he learns of this gross profiteering at his expense. How on earth can they say its discredited when its a best seller with hundreds of thousands of copies having been sold around the world, and probably would be in the UK too if the McCanns weren't threatening to sue publishers just because they are afraid for us to read it. Then we have that wonderful news paper (cough cough) that we know as the Sun On a number of occasions my local has been offering it for free and still no one wants it. So - Well done with your best seller Snr Amaral, and thank you for bringing us a truthful and sensible report on this case. Verdi tells me the Sun makes a good option for lining the bottom of his budgie's cage. It's a pity PeterMac decided his work should be published in a FREE e-book - it's been viewed over 60 million times and he could have been retired on a luxury yacht sailing around the Canary Islands by now. I've bought a couple of Dr Amaral's book in Portuguese, just as a show of solidarity. Please excuse my shouting, I'm not prone to hysteria..
Paulo Reis - wherefore art thou? Another one for your portfolio ! Target practice is sublime ..
Will they be on the phone to R Trace this morning? How dare The Sun print that article? Mentions the ruling by the Supreme Court Judges. Oh dear and not long before the Anniversary. @Jill Havern wrote: Verdi tells me the Sun makes a good option for lining the bottom of his budgie's cage.